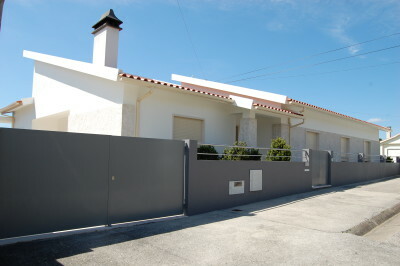 This recently built three bedroom house has been nicely built and furnished. The property has a nice feel, with its neutral furnishings but it still maintains its warm and welcoming feeling. On the upper floor there are three bedrooms, all very good sizes and niceand bright. All three rooms have built in wardrobes and one of them has an en-suite. There is a family bathroom with heated towel rails. The kitchen is fully fitted with hob, oven and extractor fan. There is a pantry, this is where the access to the loft is. On this floor there is also an open space living/dining room. There are large patio doors that come off of the living room which lead out onto a balcony. Here there is also a lovely firplace with a built-in wood burner. On the ground floor of the house, there is a large garage with automatic up and over door, and large living/dining rom, a bathroom, a laundry room and storage space. The property has good size rooms, all quite spacious and all nicely filled with natural lighting. The house has solar panels, central heating, double glazing and mosquito nets on the windows. Where the house is located is also a big plus point as it very close to Tomar and only 1.5km away from the motorway (A13) that takes you to Lisbon. In Carril itself there are a few cafés and a mini-market where you can find all the essential groceries. Tomar has a variety of supermarkets, shops, cafes, restaurants, banks, health centre, hospital, schools, sports centres and UNESCO listed CONVENTO DE CRISTO. It is also only around 10 minutes away from the big Castelo do Bode lake, where one can practice all kinds of water sports. The property is easy to access and is around one and a quarter hours drive from the nearest airport, which is located at Lisbon. Lisbon airport is serviced by several low cost airlines, which operate regular flights into and out of the United Kingdom and other European countries.